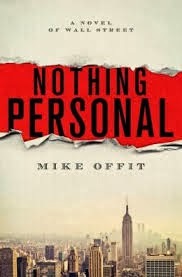 Do not let the title of Mike Offit’s Nothing Personal: A Novel of Wall Street scare you off if you are not a fan of numbers, trading, and most importantly, Wall Street. Offit is able to break down junk bonds, prepayments, and mortgage-backed securities in such a manner even I understood what was being discussed and wholeheartedly continued to turn the pages.
. . . Corelli rarely tried to enliven the material, having long before decided that, even in so inexact a discipline as his, he would grade generously those who simply recited his lectures on all exams without thinking or dissension. This practice would, he reasoned, prepare them well for life in most of corporate America. The protagonist, Warren Hament, an up-and-coming salesman on Wall Street who finds himself entangled in a murder mystery is certainly likeable and has quite a way with the ladies. Va va va and voom! For me, the problem of Nothing Personal lies in the numerous mispellings throughout this novel [i.e. anecdotess (104), omlet (152), and drive (302) instead of driven] and awkard wordings “Just as long as are not connected . . .” (319) which detracts from the reading. For the purposes of book club, crabmeat salad would be a welcome choice as it was Hament’s choice when schmoozing for the first time with an MD (managing director) from Weldon Corporate Finance after a game of squash. Previous postWho’s Afraid of the Big Bad Book? Thank you so much for your gracious encouragement, and I am honored that you took the time to read my book. It is devilish hard work to try to write a novel that is entertaining, intriguing and also informative, and I feel deeply appreciative that you seem to have “gotten” every nuance of what I was trying to accomplish. Your words are generous, and will get me back to work on my second novel right away!! I apologize for the typos and editing errors. I personally proofed the book three times, as did my wife, and a few friends, and of course, so did the pros at St. Martin's, and it no doubt went through the ubiquitous and largely useless spell-checker software that never takes context into consideration, and hasn't improved much since 1995. I hope there will be a second edition, and we can get those issues corrected! I hope you'll smile along with me at the awkwardness of the inevitable …”awkard (sic) wordings…” that come from a proofer making a cut and not healing the blended sentence. Particularly galling for me is that my first job was as a night griddle chef at the Southampton Diner out on Long Island, where I developed an early-Sunday morning, post-clubbing following for my French-style thin “omelettes,” filled with lots of melted cheese and bits of bacon and fresh herbs. And, had any of these errors slipped by me during the year I spent as an Editorial Assistant at a magazine in New York, my brutish, perfectionist Editor-in-Chief, not to mention our well-known, scholarly authors, would have hung me out the windows by my ankles! You seem like an extremely well-informed and voracious reader. My brother is the head of clinical genetics at Sloan Kettering in New York, and an accomplished researcher in breast cancer gene mutations – a much finer, smarter person than his younger brother. You seem to have drawn power from that struggle, and I LOVE your blog! !